American special operations analysts were gathering intelligence on an Afghan hospital days before it was destroyed by a U.S. military attack because they believed it was being used by a Pakistani operative to coordinate Taliban activity, The Associated Press has learned. The special operations analysts had assembled a dossier that included maps with the hospital circled, along with indications that intelligence agencies were tracking the location of the Pakistani operative and activity reports based on overhead surveillance, according to a former intelligence official who is familiar with some of the documents describing the site. The intelligence suggested the hospital was being used as a Taliban command and control center and may have housed heavy weapons. After the attack — which came amidst a battle to retake the northern Afghan city of Kunduz from the Taliban — some U.S. analysts assessed that the strike had been justified, the former officer says. They concluded that the Pakistani, believed to have been working for his country's Inter-Service Intelligence directorate, had been killed. 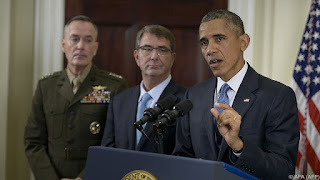 Reversing policy on Afghanistan, President Barack Obama announced on Thursday he will prolong the 14-year-old U.S. military engagement there, effectively handing off the task of pulling out troops to his successor. Calling it a "modest but meaningful" adjustment to winding down the American presence in Afghanistan, Obama said Afghan forces were not yet as strong as they needed to be given a "very fragile" security situation and the United States will maintain a force of 9,800 through most of 2016. With the Afghan security forces gravely challenged by Taliban offensives, the government is moving to rapidly expand the troubled Afghan Local Police program by thousands of members, Afghan and Western officials say. 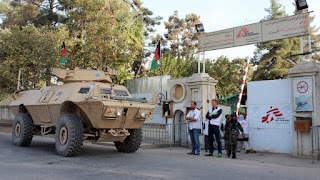 The move to expand the police militias, prompted by the disastrous loss of the northern city of Kunduz to the Taliban almost three weeks ago, is being described by officials speaking privately as an attempt to head off panic in Afghan cities threatened by the insurgents. But the expansion also amounts to an open admission that the United States’ main legacy in Afghanistan — the creation of nationalized police and army forces numbering more than 350,000 members — is failing under pressure even before any final American military withdrawal. On Thursday, President Obama called off that pullout, originally due at year’s end, leaving 9,800 American troops in the country for at least another year. Reports from the northwestern province of Faryab indicate that the Taliban has overrun yet another district in Afghanistan. Ghormach, a district that borders Turkmenistan, is now effectively under Taliban control, according to the jihadist group and the Afghan press. The fall of Ghormach took place just 10 Days after the Taliban seized the districts of Garziwan and Pashtun Kot in Faryab; the Afghan government later claimed to have liberated Garziwan. On week prior, the Taliban attempted to seize control of Maimana, the provincial capital of Faryab. The two districts are on the outskirts of Maimana, and control access from the east. Turkmenistan to CIS: Move Along Folks, Nothing to See Here! The leaders of ex-Soviet states, led by Russian President Vladimir Putin, responded to growing instability in Afghanistan on Friday by agreeing to create a joint task force to defend their bloc's external borders if a crisis arises. The move could mean that Russian troops, as part of collective forces, will be deployed to Afghanistan's borders as the U.S.-led coalition gradually withdraws from the country, leaving behind a power vacuum. 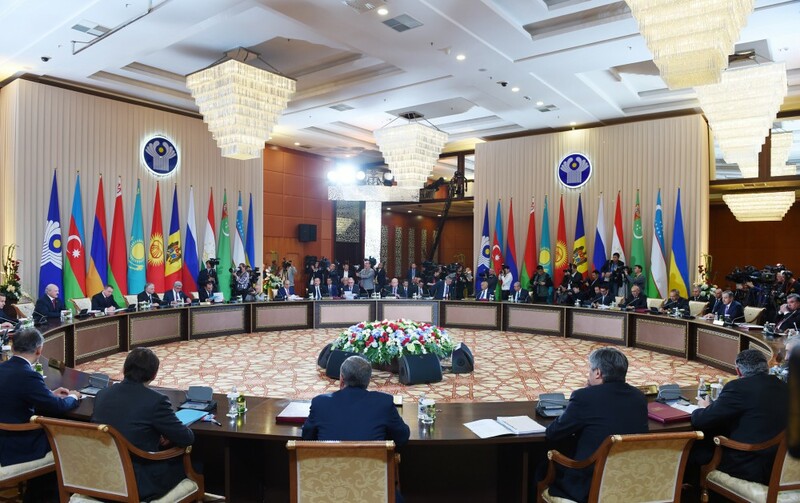 They agreed on the creation of what is described in a summit document as a "grouping of border (forces) and other institutions from CIS member states designed to resolve crisis situations on the external borders". Turkmenistan has registered no incidents at its border with Afghanistan, the Central Asian state's government said on Friday, denouncing as untrue a remark by Kazakh President Nursultan Nazarbayev. The strongly worded statement came ahead of a meeting of ex-Soviet nations to discuss the security of Afghan borders, among other issues, and followed comments by Nazarbayev who said he was aware of "incidents" that had happened at the Afghan-Turkmen border, but did not elaborate. "The Turkmen side expresses its extreme concern and incomprehension with regards to such a statement by the president of Kazakhstan about the situation on Turkmenistan's state border, which is untrue," the foreign ministry said in a statement. The four-nation consortium has revived the search for a leader to help lay the $10-billion TAPI gas pipeline, laying bare the lack of confidence among the countries to go ahead on their own and threatening to delay the project further. Just two months back, Turkmenistan, Afghanistan, Pakistan and India had agreed to co-own the project with TurkmenGaz, the state-owned firm of Turkmenistan, expected to make the majority investment in laying the 1800-km pipeline that would begin the construction work in December. Now again the timeline looks shaky. "The key challenge is to select a consortium leader or a partner. We are still looking for one," said BC Tripathi, chairman of GAIL, the state-run firm that represents India in the consortium. The top executives of GAILBSE 1.97 % and other state companies representing three other nations have been negotiating the terms between themselves and figuring out the nuances of the project for the last two months since the oil ministers of the four countries agreed in Ashgabat to go on their own without waiting for a firm with experience in laying and operating pipeline to lead the consortium. 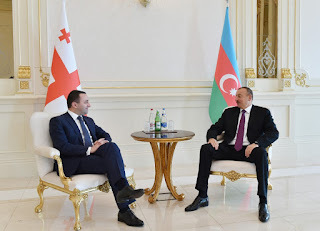 PM Irakli Garibashvili said on October 12 that Tbilisi’s relations with Baku will remain “friendly and strategic” and dismissed talk of “diversification, replacement of Azerbaijani gas” supplies as “utterly absurd”. Georgian Energy Ministry said late last week that Tbilisi was open for talks with Gazprom on possible gas supplies for private entities in Georgia in order to, as Energy Minister Kakha Kaladze and his deputy put it, “diversify” energy supplies for the country. Kaladze, who met Gazprom chief executive in Brussels in late September, reiterated on October 12 that private entities might be interested in purchasing Russian gas if the price is acceptable. After the Georgian Energy Minister spoke about possible gas supplies from Gazprom last week, PM Garibashvili made a brief and unannounced visit to Baku on October 10, where he met Azerbaijani President Ilham Aliyev, triggering speculation in Tbilisi that the surprise visit aimed at mending ties after potential fallout caused by Tbilisi’s suggestions over Gazprom gas supplies. On Saturday, at the State Chancellery, the protest ‘No to Gazprom’ rallied against Gazprom’s possible entrance into the Georgian energy market. Energy giant Russia is believed to attempt to re-enter Georgia and is said by some to be a non-trivial tool for the Russian government to manage political processes on the ground. The concerns arose after the government initiated talks with Russian energy company Gazprom. The rally involved politicians, public activists and members of the National Movement, as well as concerned citizens from all over Georgia. Tabula, a political magazine, organized the protest action against Gazprom’s possible entrance into the Georgian energy market. Number of Georgian respondents who support “government’s stated goal to join the EU” has dropped by 17 percentage points over the past year to 61%, according to a public opinion survey, commissioned by the NDI and fielded by CRRC in August. Asked whether they support or not Georgia joining Russia-led Eurasian Union, 31% responded positively, same as in April 2015, and 46% negatively, up by five percentage points from four months earlier. When the respondents were offered a choice between two answers – “Georgia will benefit more from joining EU and NATO”, and “Georgia will benefit more from abandoning Euro-Atlantic integration in favor of better relations with Russia” – 45% chose the former and 30% the latter.